the Digital Literacy Contest is back! 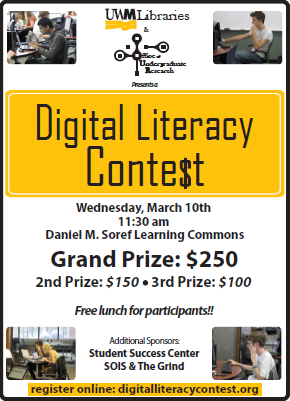 UWM Libraries and Office of Undergraduate Research are excited to bring back the Digital Literacy Contest to UWM. DLC will be Wednesday, March 10th at 11:30am in room B of the Daniel M. Soref Learning Commons. Last fall about 30 students showed up to compete for $200 in cash prizes. This semester we are offering $500 in cash prizes. First place will win $250! Second place $150 and Third place $100! Think you can win it? Register here as space is limited. Last year’s we had a tie for 1st place: Derek Leo and James Nufer. 2nd place went to Chris Langer. Due to the tie 3rd place winner did not win cash money, but she deserves accolades: Rachel Schmidt. If you competed last fall you are welcome to compete again. It will be interesting to see if we get any repeat contenders. The contest is a great opportunity for students to demonstrate their ability to use the internet to increase their knowledge. The event also gets us thinking about how we effectively (or not) we use the internet. Is it helping us in our quest for knowledge? Or is it hindering us? Big questions for a such a fun event.